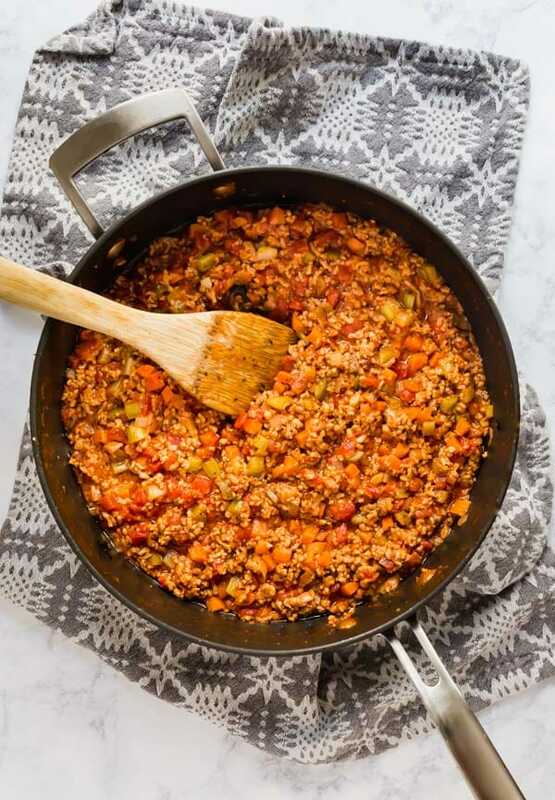 This simple Weeknight Bolognese Sauce made with ground veal comes together in less than 30 minutes and is bursting with delicious flavor! 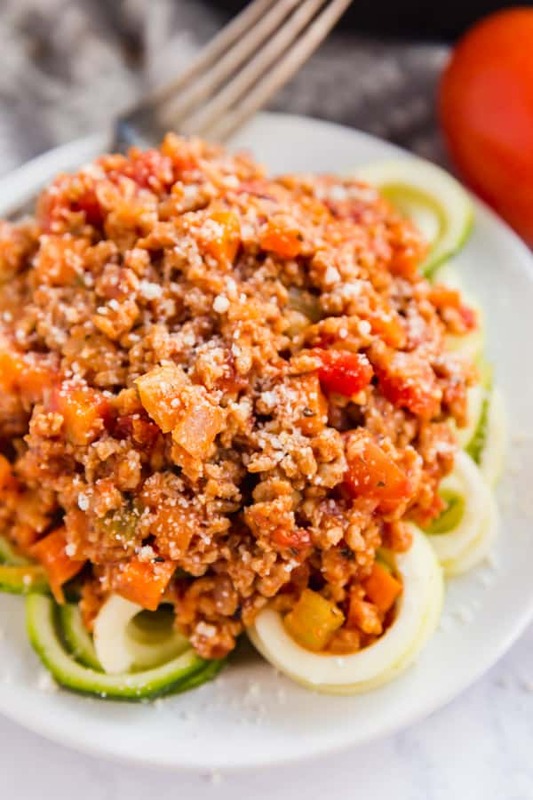 Serve it over zoodles for a carb conscious dinner that is as tasty as it is nutritious! I’m back with another killer veal recipe and I couldn’t be more excited to share it! So although I don’t buy into the whole “New Year’s Resolution” thing, I’m all about moderation. Now I’ll be honest and let you know that my holiday eating got a little bit out of hand this year. What can I say, my family makes really good food! So now I’m trying to balance things out again by making more nutritious choices that make my body feel good and make me feel a little less guilty when I give in to my late night ice cream snack attacks! And this recipe that I’m sharing today checks all the boxes when it comes to making good food choices while also being seriously delicious and quick and easy to make! Put simply, veal is meat from the male offspring of dairy cow. Because dairy cows give birth once per year in order to keep producing milk for human consumption, veal is one of the natural results of the dairy industry. With that in mind, I’ve teamed up with the New York Beef Council to bring you this recipe to help you get a fantastic meal on the table for your family in under 30 minutes. This post is especially timely because veal is a lean and nutrient-dense food that provides high percentages of essential vitamins and minerals. So it’s the perfect way to get the delicious Italian dinner you’ve been craving, while trying to keep things on the more nutritious side. Be careful not to burn the garlic because it will give the dish a really bitter flavor and you’ll need to wash out the pan and start over again! Since veal tends to be on the leaner side, I use a small amount olive oil. And although I usually drain my meat when cooking with ground beef, I don’t drain it when working with ground veal. That said, you can totally drain it if you prefer, jut add the seasonings after. I am part of the camp that does not believe in putting sugar in their sauce (gosh, I can just hear my Grandma now and her horror over the very idea!). But that doesn’t mean I settle for a super acidic sauce. As you might have seen in my Grandma’s Marinara sauce recipe and her Authentic Sunday Sauce recipe, I made a point to sprinkle in a little tiny bit of baking soda, which helps counteract the acidity while still letting the deliciously sweet tomato flavor shine through. The key to any good sauce is tasting it as you go. We all have different tastes and it’s important to cater the amounts of seasonings to your unique taste. Once it’s there, you’ll know! If ground veal isn’t available, can I substitute ground beef? Yes! This would also be a delicious beef bolognese, although I do encourage you to use a leaner ground beef. You could also do half and half if you’d prefer. Can I use fresh herbs? Sure! Either option is great, you’ll want to add the fresh herbs towards then of the cooking time. What is the difference between Bolognese sauce and Marinara sauce? 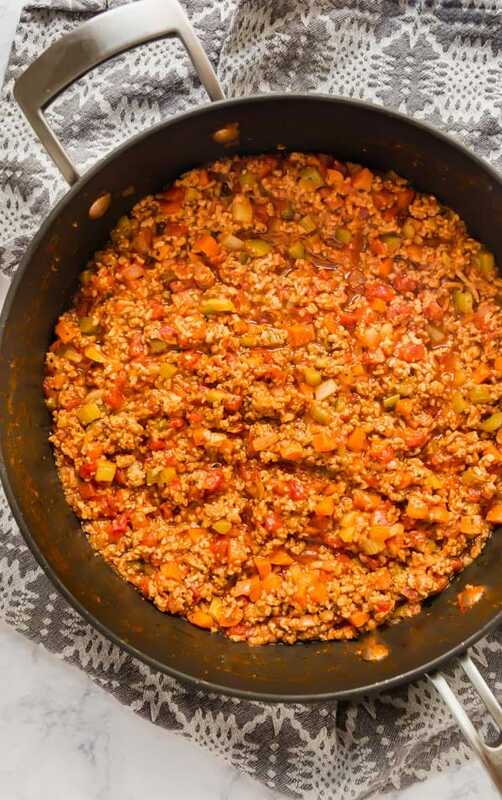 Bolognese sauce is made with a whole lot of meat and a small amount of tomatoes and other things. 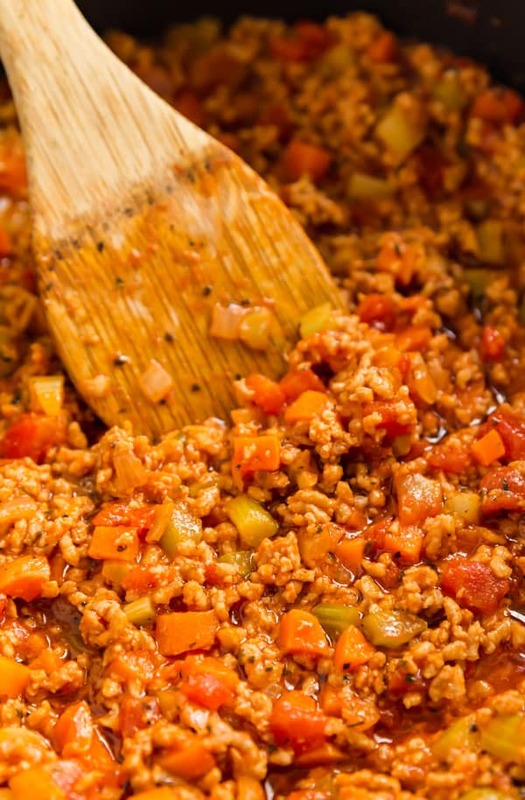 It tends to be thicker and a traditional bolognese sauce is simmer for a long time. This one is designed for a weeknight and simmers for a much shorter time but is still fantastic. Marinara sauce, on the other hand, contains no meat and can be as simple as olive oil, lots of tomatoes and garlic. How long does bolognese sauce last? This will last up to 3-4 days covered in the refrigerator. 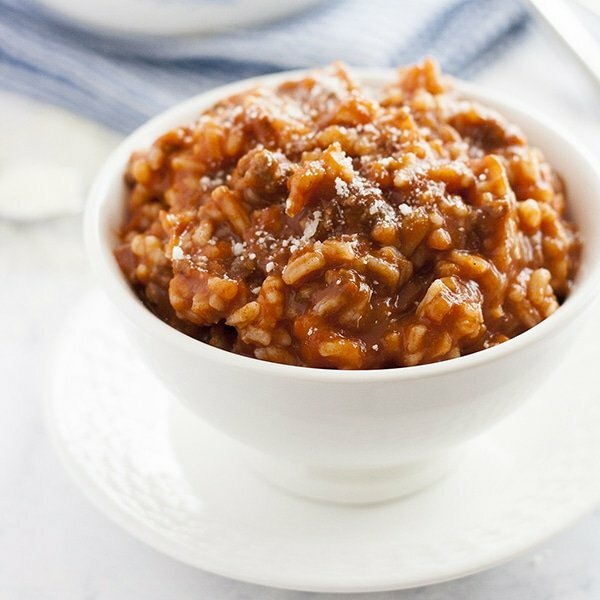 Can you freeze bolognese sauce? Yes! This freezes beautifully! Should I cook my zucchini noodles before topping with sauce? That’s entirely up to you. bolognese tends to be heavier since it’s a pretty meaty sauce so I prefer them raw (the piping hot sauce cooks them a teeny bit). I also use a slightly thicker setting in my spiralizer so that the noodles hold up better under the weight of the sauce. You other option is to add them to the sauce in the final moment of cooking. Give them a quick toss and serve immediately. Or if you’d rather, serve it over your pasta of choice. In a large saute pan, heat the oil over medium high heat. Add the onions, carrots and celery to the pan and sauté until softened stirring often, about 4-5 minutes. Add garlic and sauté stirring often until fragrant, around 1 minute. Add the ground veal and sauté using wooden spoon to break up the meat as it cooks until the veal is fully browned, around 5 minutes. Add salt, crushed red pepper, dried basil, dried Italian seasoning, wine, milk, diced tomatoes, tomato paste and baking soda and stir until well combined. Simmer uncovered for 10 minutes stirring periodically. Serve immediately over zucchini noodles or pasta with a sprinkle of Romano or Parmesan cheese. 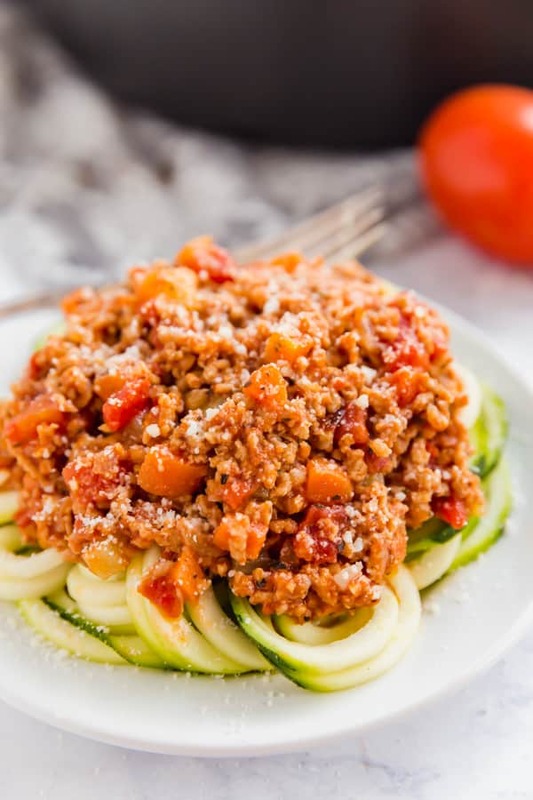 January 14, 2019 at 3:23 pm This looks fabulous, and I love that you used zoodles instead of wheat pasta! We're going low carb this year, and this is a perfect dinner for us! January 15, 2019 at 5:52 pm Thank you- I hope you love it! January 14, 2019 at 5:18 pm This is my kind of dinner! January 15, 2019 at 5:51 pm Thanks Dorothy! We love it! January 17, 2019 at 6:39 pm I love that this is so easy to make! January 18, 2019 at 10:19 pm Thanks Toni!